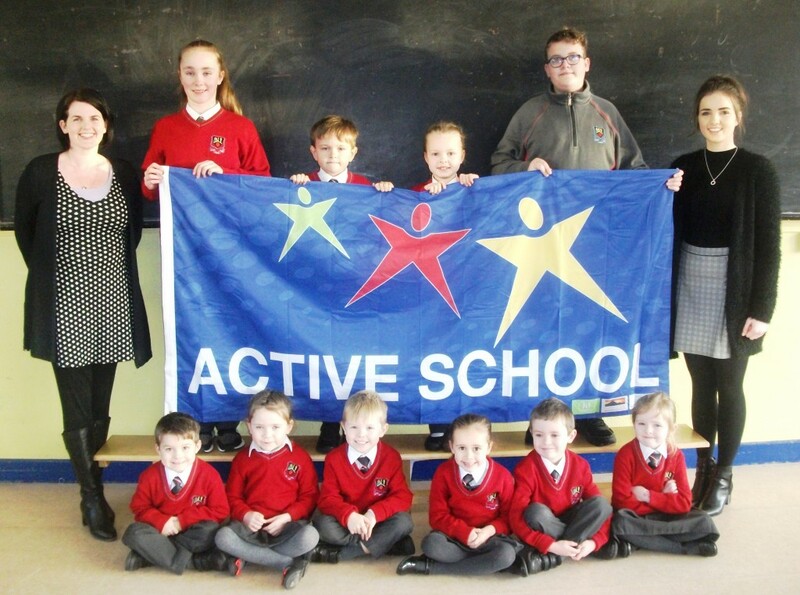 Muskerry News | Scoil Chroi Iosa awarded active flag! Scoil Chroi Iosa awarded active flag! January arrived lovely and mild in Blarney but we finished up with snow. The classroom is a timeless and magical place when the cry goes up ‘snow’. There is nothing the poor teacher can do to prevent the children rushing to the window transfixed by the wonder and beauty, as our village and castle get blanketed. The downside of course was when this unfortunate teacher was greeted by a barrage of snowballs the following morning. It keeps us young! Our school was awarded an ‘Active Flag’ at the turn of the new year. This prize is allocated to schools where the children follow a regime of fitness and activity. Much work and organisation goes into achieving this accolade. As a school with a strong tradition of sports and active learning we had a head start, but we still needed more to succeed. Ms. McHugh and Ms. Morgan took the lead in organising whole fitness activities and classroom based exercise. Huge credit is owed to these two teachers in ensuring the children of Blarney remain happy, healthy and fit. Speaking of sports, the children were delighted to learn that Blarney GAA have returned for weekly hurling training. The emphasis of this programme is to make our national sport fun and accessible for every child. We owe our local club a debt of gratitude for the time, resources and effort they give to our community. Thanks to Conor, Peter and the highly organised Mr. O’Leary for working so closely with our school. Catholic Schools week was celebrated in our school in January. This years theme was ‘celebrating the work of our local schools’. Our school uses this opportunity to reflect and assess how we are fulfilling our mission to care for all children and nurture them to become the best that they can be. For the children, the highlight was honouring our tradition of gathering rushes (and getting stuck in the mud!) in Waterloo followed by an epic St. Bridget’s Cross making session to wrap up the week. Our school is participating in the European Movement of Ireland’s ‘Blue Star’ programme. This scheme, headed by past pupil Noelle O’Connell, sees the children engage in project exploring democracy and the European Project. Our children study curricular topics such as history, geography and civics. The values of liberal democracy, peace and freedom are at the core of the E.U.’s ethos. As part of the scheme the school receives a visit from an elected politician and local T.D. Billy Kelleher duly obliged. Mr. Kelleher spoke to the Senior classes discussing everything from ‘Brexit’ to ‘do they really eat sprouts in Brussels’. Please visit bluestarprogramme.ie for details. ‘Blarney NS Road Safety Day’ was organised by Community Garda Seán Dwyer. Garda Seán promoted awareness of road safety for our kids. The children practised the ‘Safe Cross Code’ under the guidance of Jill O’Keeffe, Lollipop Lady. Local Gardaí are always on hand to guide our children, with ‘Defensive Road Use’ the order of the day. It is vital that we constantly remind our kids to use our roads mindfully and stay aware at all times. Táimíd go léir inár scoil ag obair ar ár dTuairisc Fheinmheastóireachta agus Plean Feabhsúcháin. Tá béim ar an gnáth Gaeilge a bhainimíd úsáid as dtríd saol na scoile. Ach anois teacht an tEarraigh, agus mar a dúirt Rafftery an File,‘tar éis Fhéile Bríde árdoigh me mo sheol’. Beimís an gnóthach i rith Mí Feabhra agus mar sin, coimeád súil ar scins.ie faoi eolas agus griangrafanna. Go dtí Mí an Mhárta, slán agaibh go léir.